I'm not an audiophile, nor do I pretend to be... I have heard a few mid level to mid top tier speakers... You really cannot judge a speaker until they are sitting in your house. I have owned these Emotiva ERT 8.3's since 2009. Honestly, they just keep getting better with age and locations. What I like is the adjustments, you can really tweak these speakers. You can get some pretty good bass out of these, but where they really shine is the finer details that you rarely ever hear in a song or movie. They continue to impress. They are power hungry, so I am running them through the Emotiva 2 channel XPA amp, which is the same vintage as the speakers. Where they shine is at mid to high volume, movies come alive. I also have the ERM center and ERD surrounds running off of the XPA 3 channel amp, along with three SVS subs running through the Emotiva USP-1 preamp, the Emotiva amps do the heavy lifting... I have not tried these on my Denon X4400H, even though it says it can handle them, not interested in trying. The weakness! I can tell you that easily, you better have a tight room with sound deadening or treatments to get the most out of these speakers. They can get very bright, even though they are not a bright speaker, not warm either, they are rather neutral in the right setting, which is what I have currently, nice and neutral. My new house, and listening area is built like a brick outhouse. Very tight, acoustically my listening area is 8 out of 10. Heavy MDF in the floors, and very thick drywall over wood. this is a custom built home, and the previous owner really knew what he was doing. This house is sound proof. And that fact makes all of the difference in the world as to how gear sounds in here. So, treatments are a given with these speakers, don't expect to get anything out of them in a drywalled stick built room. Would I buy again? Yes. Would I recommend? Depends on where you are going to set them up. If you can get for a good price, I would give them a try, just make sure you have the horse power to run them if you want to get the most out of them. I have never clipped these things, and have had them up over 100db. 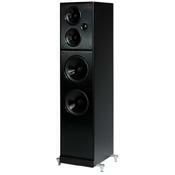 Emotiva has become very impressive supplier to the budget minded audio enthusiast. These speakers are another fine example of just what you can achieve without breaking the bank. The construction is solid and the sound is actually on par or above most of the speakers in this price range. The design is a bit sparce in comparrison to some of the more notable companies products such as B and W, Polk, etc but I tend to judge speakers on sound quality, build construction and bang for the buck. Well Emotiva certainly hit the nail on the head with this line of speakers. You could certainly do alot worse with other products. Great Job! !